ME! Bath Shower Sherbet is a lathering sugar scrub packed with Vitamin E, to exfoliate, cleanse and moisturize you skin leaving it smooth, soft, and yummy! Gotta Have It Pomegranate - Throughout history, this richly colored antioxidant has been revered as a symbol of health, fertility, and rebirth. Aphrodite, the goddess of love, said the pomegranate was a powerful “love potion”…go ahead, cast the spell…bathe in sweet luxury and eternal life. ME Bath Body Icing 8 fl oz. 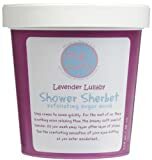 ME Bath Shower Sherbet 16 oz. ME! Bath Gotta Have It Pomegranate Body Icing, 8 fl. oz.